부여 무량사 소조아미타여래삼존좌상은 중층전각으로 이루어진 극락전의 주존불로 봉안되어 있는데, 17세기 대규모 사찰에서 널리 조성되었던 대형의 소조 불상 양식을 따르고 있다. 이 삼존상은 아미타·관음·대세지라는 분명한 아미타삼존 도상을 보여주고 있고, 이미 발견된 복장발원문을 통해 현진(玄眞)이라는 조각승과 1633년이라는 정확한 조성연대를 알 수 있어 조선후기 조각사 연구는 물론 조각 유파 연구에도 귀중한 작품으로 평가된다. 거대한 규모로 조성되었기 때문에 불신의 전체적인 모습이 도식적으로 단순화된 감이 있으나 양대 전란 이후 자존심과 자신감을 회복하고자 노력했던 당시 불교계의 저력을 느낄 수 있는 기념비적인 작품이라고 할 수 있다. 17세기 전반기 대형불상에서 삼신 또는 삼세불상이 결합된 삼존형식이 대부분인 가운데, 극락전의 주존으로 아미타·관음·대세지보살이 결합한 삼존도상의 드문 예로서 그 가치가 더욱 크다. 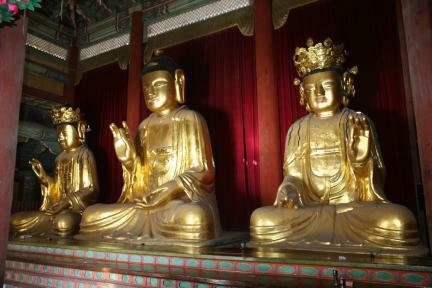 Echoing the style of big clay Buddha images enshrined at many large Korean temples in the 17th century, the Triad is the principal icon of the Geungnakjeon Hall, a two-story pavilion, of Muryangsa Temple in Buyeo. The Triad consists of Amitabha, Avalokitesvara and Mahasthamaprapta. A letter of invocation found inside the Images along with other artifacts states that the Triad was made in 1633 by the Monk sculptor Hyeonjin. With its production date clearly revealed, the Triad is regarded as a valuable resource for studying the history of sculpture and different schools of Buddhist sculpture of the late Joseon Dynasty. Probably due to difficulties in carving large-sized figures, the Buddhas tend to look somewhat formulaic in appearance, but they are still monumental works demonstrating efforts across the Buddhist community to restore self-confidence and pride in the wake of the two major wars with Japan and Qing. The iconography comprised of Amitabha, Avalokitesvara and Mahasthamaprapta is rare for the early 17th century, when Buddha Triads mostly consisted of the Buddhas of the Three Ages or the icons representing the threefold body of Buddha.